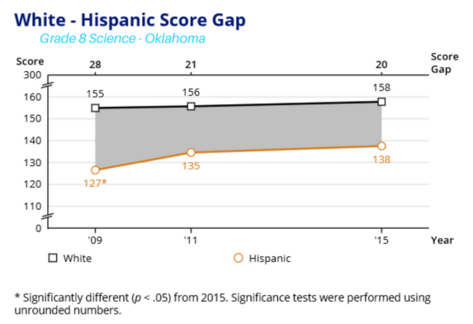 OKLAHOMA CITY (Oct. 27, 2016) – Science scores on the 2015 National Assessment of Educational Progress (NAEP), released today, show Oklahoma making some of the largest gains in the nation in narrowing performance gaps. In fourth-grade science, the white-black performance gap decreased nine points, from 32 in 2009 to 23 in 2015. 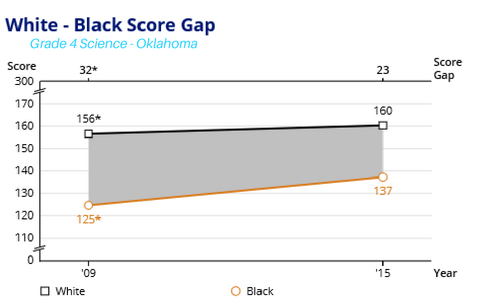 Oklahoma’s fourth-grade black students had the second-largest gain in science scores, behind only Tennessee. In eighth-grade science, the white-Hispanic performance gap decreased eight points, from 28 in 2009 to 20 in 2015. Oklahoma’s eighth-grade Hispanic students had the third-largest gain in science scores, behind Utah and South Carolina. State Superintendent of Public Instruction Joy Hofmeister said the results indicate Oklahoma is moving in the right direction and there is reason to celebrate. 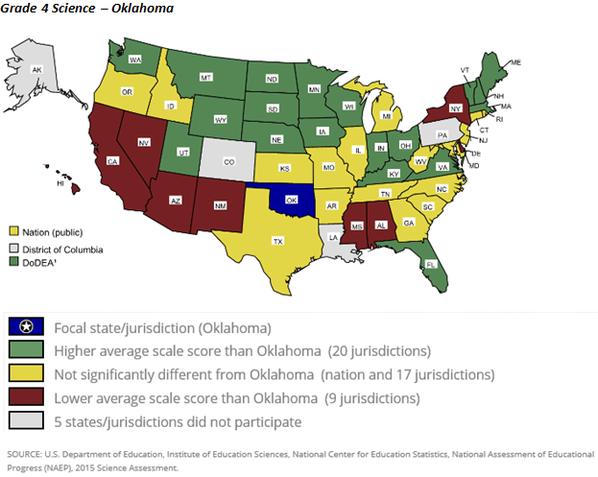 In fourth-grade science, Oklahoma was among 18 states/jurisdictions to see growth. In 2015, the average score of fourth-grade students in Oklahoma was 153, up from 148 in 2009 and consistent with the national average of 153. 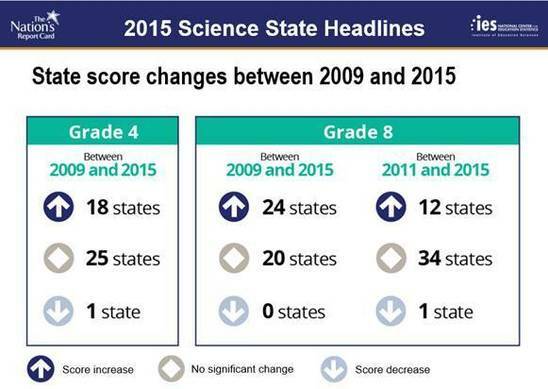 In eighth-grade science, Oklahoma was among 24 states/jurisdictions to see growth. In 2015, the average score of eighth-grade students in Oklahoma was 151, up from 146 in 2009. Despite the growth, Oklahoma eighth-graders still fell below the national average of 153. NAEP scores indicate that 34 percent of Oklahoma fourth-graders who took the test scored at or above proficient level. This was less than the national average of 37 percent. Twenty-eight percent of Oklahoma eighth-graders scored at or above NAEP proficient levels, below the national average of 33 percent. Oklahoma adopted new science standards in 2014 that are aligned to NAEP and emphasize critical thinking and problem solving. Oklahoma shows gains in five of the six areas assessed in 2015. NAEP is the largest national representative and continuing assessment of what students in the United States know and can do in various subject areas. The science assessment is comprised of three content areas: physical science, Earth and space sciences, and life science. Full results for the nation and states are available online. Math and reading results, released in October 2015, are available here. Superintendent Hofmeister was recently named to the CCSSO Policy Task Force charged with providing state feedback and recommendations to the National Assessment Governing Board on policy areas and projects related to NAEP. Members are chosen based on expertise and interest in assessment and geographic representation of the nation.